Do you want something different for your home or business? The best way to make a statement is with a unique feature; and what’s more unique than an entire wall made of natural stone? 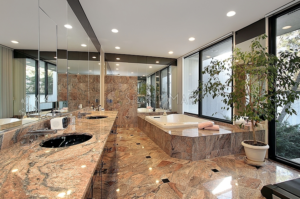 You can choose from granite, marble, travertine, mosaic, mother of pearl, limestone, and semi-precious. Fireplace: Our stone wall panels can be cut to fit around the fireplace. This is your chance to upgrade the look of your fireplace. Entire wall: Be bold and replace an entire wall with a stone panel. Adding a stone wall in the bathroom is a great way to make a certain wall stand out without decorating it. Feature: Want to make a certain wall stand out in your home? Make it a feature wall by using our natural stone to decorate it. You can get creative and come up with more ways to use our natural stone wall panels; the possibilities are endless. We look forward to helping you create a masterpiece with natural stone. Discover a wide variety of stone wall panels in Los Angeles at Stone Mart. Contact us today for additional information about the types of natural stone slabs we offer.